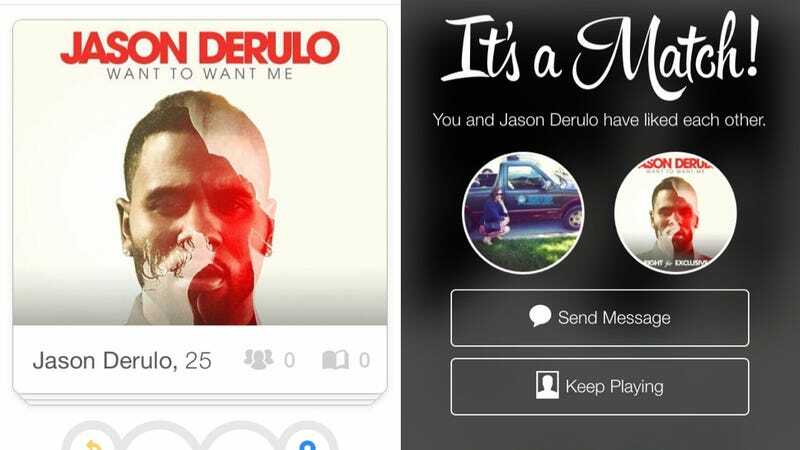 A little after 10 am on Monday morning, I logged into Tinder after an extended time away with a very important purpose: to match with Jason Derulo so I could watch his new video "Want To Want Me," which he announced last week he'd be debuting on the app. Unfortunately, my relationship with Jason (and–briefly–his potential relationship with millions of others) was not wholly successful. "Social media and dating together is the new wave," Derulo, 25, tells Us. "It is the source of one half of the relationships in 2015, and I'm all about being part of the new wave. A lot of my friends and family members are on Tinder... [It's] the perfect place for my new single, 'Want to Want Me.' On Tinder, you swipe left or right and want the person you like to want you, too. It is a cool and unique way to deliver my new video to the world." Because despite Tinder being the "perfect place" for "Want To Want Me," Jason actually has no plans to join the service, preferring to rely on family and friends to help him "sift through the weirdos and find someone cool out of all the people I meet at clubs or events." "I would if it wasn't so unpredictable," he tells Us. "I'd probably meet some huge fans, but otherwise it's not a safe bet. Maybe if they come up with a version of Tinder for celebrities, then I would do it. I do think it is a beautiful thing and works." Well, whatever works, Jason—but it did not work when I tried to match with him on Tinder. Though it was announced that the video would drop at 10 am ET on Monday morning, with Jason tweeting as such, I swiped left on 200 dudes before getting pretty frustrated that Jason's beautiful visage wasn't appearing before my very eyes. Maybe they're trying to make it complicated, I thought. I'll swipe right AT RANDOM just to see if that unlocked a secret "like" code. No dice. I checked the tweet again. It was gone! Technical difficulties in love land? All that remained of the evidence I'd be able to find Jason on Tinder was a retweet by Tinder of an MTV story from Saturday about the news, a promo video for the full video on YouTube and a post on Instagram. After an hour or so of intermittent swiping, two matches and a glimpse of a photo of a dude who was posed with Jack McBrayer of 30 Rock, I was about ready to give up, before I noticed that Warner Bros. Records was also promoting the video. I also saw that at least one human out there in the universe had connected with Jason, 25— though his tweet about this new relationship made it clear that the video was not actually available in the app. It was, however, available through a link to a private YouTube video in a message sent by Jason. This was enough to convince me that while our relationship might have gotten off to a rough start, my future with Jason was solid. (I had been just about ready to type that tiny URL into my browser, convincing myself that since he's been throwing himself out there to the masses via a variety of social media platforms—he recently joined Justin Bieber's app Shots, which is as thirsty as you can get—I should get mine where I could.) I returned to the app, and, after a few swipes left, there was Jason, right where it was now confirmed he would be. Here is the video I had been searching for. While it seems to ever-so-slightly overplay the emotion most people feel when they swipe right and make a connection on Tinder (writhing on the bed in a hot sweat is not something I'd do after seeing a very small photo of a man's face, their name, age and a short "joke"), I suppose the general sentiment is there. After all, the lyric is, "I would do anything, anything and everything, just to get up next to you." Sadly, my attempts to make a deeper connection with Jason were stymied. I did learn one important thing that I was unaware of before this journey: there is something more annoying than swiping through Tinder looking for dudes you'd want to date, and it's swiping through Tinder looking for Jason Derulo.